It's time for What's On Your Workdesk Wednesday - well, it will be by the time this posts itself tomorrow when I'll be a work. 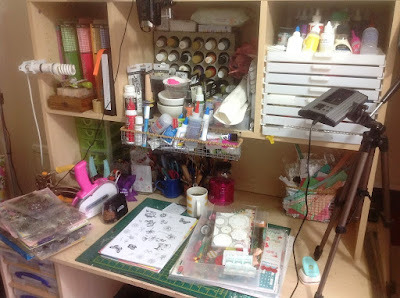 I'll pop over to Julia's blog Stamping Ground later to catch up, say hello and see what everyone else has on their workdesks this week. You can see that I've been doing more tidying - just look at all that space!! The messy cubbyhole top centre is actually organised chaos, I know what's there and can easily get to all of it, which means I may actually get around to using some of it :o) To the right is a new light which I've bought from Amazon as part of my plan to take better photos of my projects for posting. You can adjust the brightness and the colour temperature and it can also run on a battery so you don't have the annoying dangly wire. On the actual desktop is a pile of stamped images waiting to be coloured in, and next to that my February Counterfeit Kit. The inspiration kit was "Weekend in Paris" from Noel Mignon. I've called my version "Happy Hour". That lamp sounds interesting - you will have to keep us posted on results. Love your desk - shows what you can get into a smallish area when I think of all the shelf space I have and how I cannot find anything. Our days seem to flip between messy desk/tidy desk, don't they?? Nice space! Its good when you have everything to hand, it really does make you use what resources you have. That light sounds a good buy, can it run on rechargeable batteries? That would be a long term help eh? You clever Vegemite cleaning up like that Annie, would you like to come to my place, I’ll even take you to the beach for a swim!! ;-) afterwards!!! Love your space,but do wonder why they made a dangly wire like that on such a lovely light. Hi Annie. Looks like you are incredibly busy with lots going on there on your neat and tidy desk! Well done. Cor, it looks great! Love the look of the new light, although it scared me at first, lots of buttons! I am admiring of the counterfeit kit thing, I never manage to put anything together that works when I use it! Happy colouring, nice work for a relaxing session at the desk.